Two weeks back, I had been to Thane station to receive my relatives who were coming from my native place. 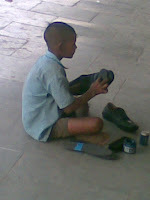 While I was waiting for the train to arrive, I saw a young boy walking with a carry bag and a shoe brush in his hand. Three gentlemen were sitting on a bench nearby. This young boy approached them and asked whether they would like to get their shoes polished. After lot of persuasion, he managed to convince one of them. What followed after that kept me interested for quite sometime. He pulled out all his stuff from the bag and sat down. He then started his work and was doing it with utmost sincerity and dedication. I could not stop myself from clicking a snap of his using my cellphone camera. The gentlemen kept asking questions to him. He answered them and at the same time kept working diligently. He seemed very experienced by looking at the manner in which he went about doing his work. Two things came to my mind. First, a kid of his age should be in school and not working. Secondly, he could have opted to beg or worst, steal. The first point was very concerning but it could be quite possible that he might be going to school in the earlier part of the day. I hope this assumption of mine holds true. I did not get a chance to verify this with him. The second point made me think highly of this kid. Instead of opting for an easy way to make money like begging or stealing, he opted to do it through dignified labor. The kid definitely has the right attitude. I only wish that his right attitude meets with good opportunities to help him achieve success in whatever he decides to do in life.